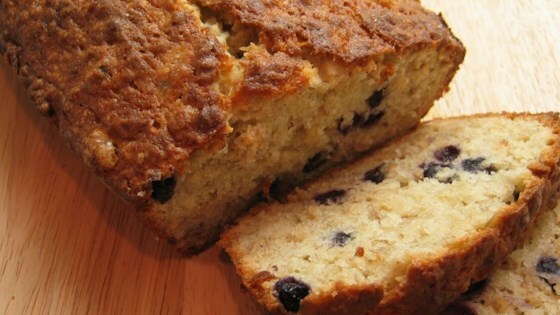 "This is so good and reminds me of a real moist kind of a sweet quick bread. Everybody asks for the recipe: this bread is moist, and easy to make too. Note: If you are using frozen blueberries, you can thaw them in the microwave for about 3 minutes. However, you need to increase the amount of blueberries to 3/4 cup." In a medium bowl, toss blueberries in 2 tablespoons flour. Gently stir blueberries together with oats, nuts, 1 1/2 cups flour, baking soda, and salt. In a large bowl, cream shortening. Gradually add sugar, beating until light and fluffy. Add eggs one at a time, beating well after each addition. Stir in mashed banana. Add blueberry mixture to creamed mixture, and stir just until moistened. Spoon batter into the prepared pan. Bake in preheated oven until a wooden toothpick comes out clean when inserted in the center of the loaf, 50 to 55 minutes. Cool in pan for 10 minutes. Remove from pan, and cool completely on a wire rack. You may substitute walnuts for the pecans, if you like. This bread is wonderful! I've never been a big banana bread fan but really like this one. My family likes it as well. My whole neighborhood is raving about this now, it is absolutely wonderful.